Thomas was born in 1888, the son of Henry Maccabee and his wife Elizabeth (Eliza) née Vokin. His father, Henry was a painter and decorator, several of his sons, including Thomas followed him into the trade. The family lived at Rose Cottage in Enborne for many years before moving up the hill to Wash Common, Newbury in 1908. There they lived in a house named Roseleigh, in what was initially Cromwell Road - renamed in the 1930s as Battery End (a name more fitting to its location on the site of the 1st Battle of Newbury in 1643, in which Cromwell took no part). After completing his schooling Thomas worked as a painter, possibly starting as his father's apprentice, until war interrupted his life. 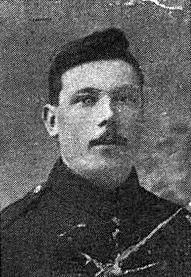 On 14 December 1914 he enlisted with the Royal Berkshire Regiment serving with the 2nd/4th (Territorial) Battalion. Almost three years later the Battalion was in France, near Villers-Pouich, a few miles south-west of Cambrai. The British offensive known to history as the Battle of Cambrai has started on 20 November 1917 with, for the time, massive initial success. After a few days the Germans launched a counter-offensive that gradually pushed the British back towards their initial positions. On 3 December the 2/4 Royal Berks were ordered to man a section of the original front line in front, notably a position known as Corner Work on the outskirts of a hamlet called La Vacquerie. They faced heavy attacks all day as the enemy gradually took back ground they had lost thirteen days earlier. The sad death of Sergt T A Maccabee, second son of Mr and Mrs H Maccabee, of Wash Common, as the result of shockingly severe injuries sustained whilst serving in France during the war, occurred on Monday at the Pavilion General Hospital, Brighton. 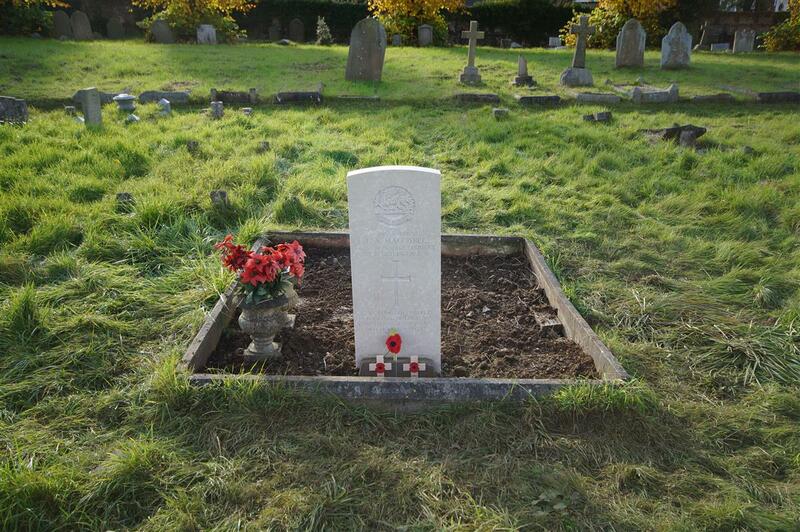 Deceased joined the army as a private in the 2/4th Royal Berks Regiment in November, 1914, and was in training at Chelmsford and other camps, until drafted to France in May, 1916. Promoted to the rank of Sergeant, he was a favourite with his men, and took part in many engagements with the enemy. Early in 1917 he was gassed and suffered with trench fever, which necessitated a stay in hospital for some time. He was badly wounded in the battle of Cambrai in December, 1917, and lay on the battlefield for three days and nights with legs shattered by the explosion of a shell. Upon arrival at a dressing station he was found to be suffering from frost-bitten fingers, and upon his removal to the 3rd General Australian Hospital at Abbeville, it was found imperative to amputate both legs and seven fingers. He was conveyed to the Southern General Hospital at Portsmouth in March, 1918, where he remained until July of the same year, then being transferred to Roehampton to be supplied with artificial limbs. His wounds, however, continued to cause pain and trouble, and he was sent to Brighton for further operations. He returned to Roehampton in January 1919, and two months later paid his first visit to Newbury since going abroad. He was then discharged from the army, but was continually under treatment and early this year went again to Brighton, when two most dangerous and critical operations were performed on February 8th. No hopes were entertained of his recovery, and his next of kin were wired for. His parents remained with him for ten days, when his condition had improved, and he seemed out of danger. On February 27th hemorrhage set in, and the patient collapsed, and his parents arrived and were present with him when he passed away on March 1st. Deceased had nineteen operations, all of which he had born with remarkable patience and fortitude. His age was 31, and he had four brothers all serving with him in France at the same time. Although he is recorded as Sergeant in this account, his substantive rank appears to have been Corporal, he must have received a temporary promotion in the field. No doubt this would have been confirmed had he not been wounded. He was officially discharged from the Army on 18 March 1919, unfit for further service. Thomas's grave in Newbury also commemorates his brother Reginald. Following his death in Brighton (in the Brighton Pavilion, which was used as a hospital from 1915-1920) his body was returned to Newbury where he was buried on 5 March in Newtown Road Cemetery with military honours; soldiers from his regiment escorted the funeral cortege from the Maccabee house in Wash Common to the Newbury Baptist Church (then in Northbrook Street) where a service was led by the pastor, Rev C V Pike. After the service there was a procession to the Cemetery, where six soldier bearers carried his coffin, covered with the Union Jack, to the grave, a firing party following with arms reversed. After the committal three volleys were fired over his grave and the Last Post was sounded. Among the mourners were his parents, his six surviving siblings and his fiancé, Miss L Hill. His parents joined him in the grave in 1934 (Henry) and 1939 (Elizabeth). The kerbstones marking the grave also bear the name of his brother, Reginald, who was serving with Thomas in the 2/4 Royal Berks and died on 4 December 1917 in a casualty clearing station. It is likely that he was wounded on the same day as Thomas and no more than a matter of yards away. For more on Reginald click. 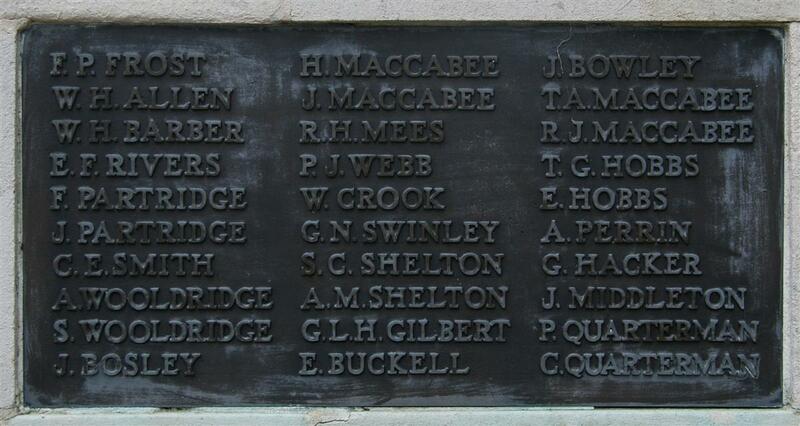 Thomas' name is also commemorated on Newbury Town War Memorial and on the Newbury Baptist Church War Memorial. Thomas was not recorded on the Commonwealth War Graves Commission roll of honour until 26 June 2014, an omission that was rectified thanks to the research that underlies this story and the In From The Cold Project. His three surviving brothers, were William Henry, Sidney Frank and Montague Albert. William Henry served with the RAMC; Sidney Frank served with the Somerset Light Infantry until he was invalided out with shell-shock in 1917; despite this he re-enlisted in 1919 and served through to 1931. The family of Mr and Mrs H Maccabee, of Roseleigh, Wash Common, are doing good service for their King and Country, having now four sons and a son-in-law engaged in the forces. William, the eldest son, is serving in Egypt with the RAMC, Thomas and Reginald, who are in the 2/4th Royal Berks, are stationed at Salisbury; whilst Sidney, the fourth son, is now in training at Wareham, in the Somerset Light Infantry. Sidney Tidbury, son-in—law, is in the 3rd Berks, and stationed at Bulford Camp. One can only wonder what his parents thought when Montague got his call-up papers in February 1917 and their fifth and youngest son set off to war. Special thanks to Terry Denham and all at In From The Cold for their help and advice which resulted in the Commonwealth War Graves Commission adding Thomas Maccabee to his well deserved place of remembrance on the national Debt of Honour roll.